As we complete nearly one year of cruising and living aboard our sailboat, I wanted to reflect on some summary statistics. We take a lot of digital photos as we travel and this year we set a record in photos and in nautical miles. How Far did we SAIL? Total Miles traveled in this first year of cruising ………………………………………5,777 nautical miles! Note: You can see our Google Map of the ICW to Bahamas trip here. Of these 13,824 photos, we blogged 2,146 photos here on this blog. Of these 2,146 photos, we selected 318 best photos and created our VIDEO PHOTO ESSAY HERE. NOTE: I have a typo in this video of 2,514 nm, it was 3,514 nautical miles. What Cameras do we have? Canon EOS D30 with 300 mm lens and a 28-75 mm lens. How do we process photos? We use Google’s Picasa photo application and we store all photos locally on our own laptops and portable USB drives. We process each blog photo down to 1024 x 768 image size. Blog pictures can be clicked on and then they are presented full screen size. We have enjoyed this first year’s planned adventure so much that we both have decided to do it AGAIN next fall. After the ICW and Florida, we will explore the Exumas and lower Bahamas and then come back north into the Abacos. We both agree….there is no better life than cruising aboard our boat! We set a new record running north as we ran 87 nautical miles from Portsmouth VA up the Elizabeth River to the Chesapeake Bay and north to the Honga River, where we dropped the hook after 13 hours of motor sailing. We are running with our team leader, SP Catspaw as we make our way home to Rock Hall, MD. Day two, we ran 67 nautical miles from the Honga River to Rock Hall, MD departing at 0601 and arriving RHMD at 1800. Passing under the center span of the Chesapeake Bay Bridge returns us to our “HOME” waters, a place where we have sailed since 1984. We recall when leaving the sight of the Rock Hall Water Towers seemed like a long way “out” on the water and we would quickly turn around if we lost sight of them. 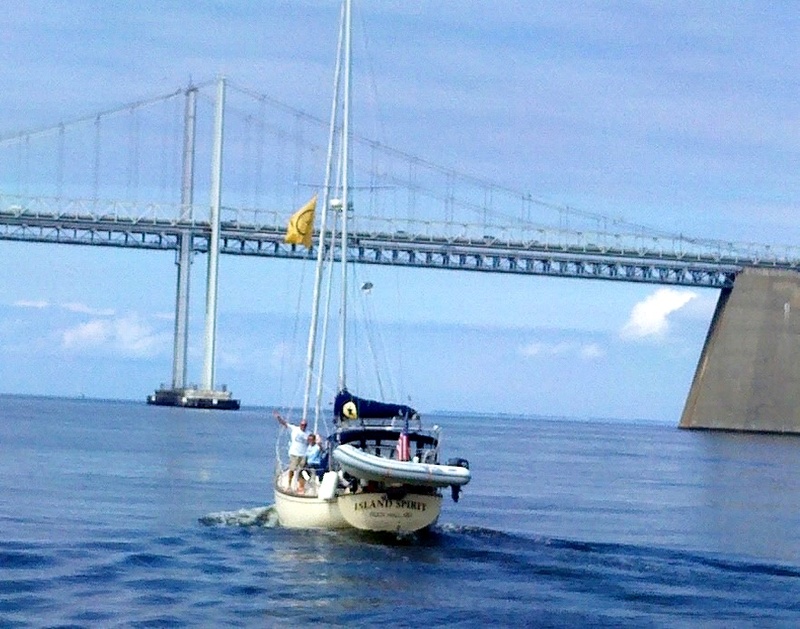 Now, with 2,500+ nautical miles under our keel since October, 22, 2011, the Bay seems a bit smaller. It is funny how your perspective keeps changing as you sail more, travel greater distances, and discover new horizons. We now think that running to Miami is simply a bunch of 50 mile days or a few offshore legs. We still enjoy the Bay, and we feel very much at home here, and we especially feel at home in Rock Hall, MD. We know the people, we have good friends here, and we have the support of the Island Packet Yacht Dealer, Gratitude Yachting who hooked us on sailing Island Packets back in 1988. Thank you, Ed Kurowski, we are still enjoying the ride. So, as we cross the sand bar off town and round G”5″ near the familiar Rock Hall tower, we motor into Swan Creek, waving at the Gratitude Yachting Center staff and thanking them for the many happy years and dreams their boats have given us. Beyond Gratitude, we pull into Spring Cove Marina, where we have docked our boats since 1991. Madelyn Reni, the owner, is such a good friend and she always makes us feel welcome and at home. She also provided a slip for our Team Leader, buddy boat and good friend, Carey, on SP Catspaw. Thank you, Madelyn, for welcoming us back… It is great to be HOME….. Note: Full summary and reflection post to follow…. Arriving Portsmouth VA, from Great Bridge and the ICW, we have reached ICW mile marker 001. That means that we have now completed the Intracoastal Waterway from Virginia to Florida into the Keys and up the west coast of Florida to Punda Gorda. We are feeling a sense of accomplishment and pride as we complete this first year of full-time cruising, living aboard our Island Packet 35. Here in Portsmouth, VA, we always take a few days and enjoy the Olde Towne with great restaurants, pubs, bakeries and movie theater. We rode the paddle wheel ferry over to the Norfolk side of the Elizabeth River at Watersides and walked to the mall where we were overwhelmed by the USA marketing machine. We bought nothing….because we need nothing…yet it was still fun to act like you were shopping for something that you really didn’t need. Cruising does change your perspective on what is really needed, and this trip into an upscale mega mall reminded us of just how much we have been changed by this year afloat. The weather turned on us as a low pressure built off the coast of Carolina and kicked up N and NE winds of 20+ knots. 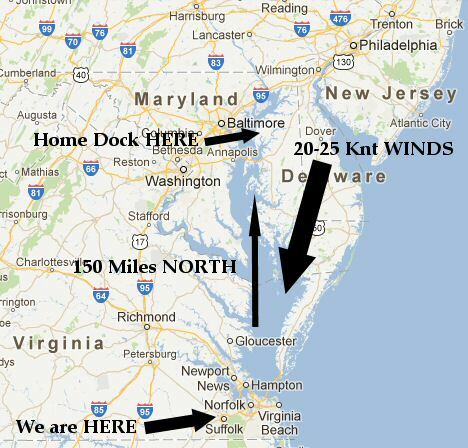 The course up the Chesapeake Bay is due North. So, with a North or Northeast wind of 20-25 knots, the seas come up and we really did not want to bash into that for 150 miles. With that situation, we simply remained at dock for 4 days in Portsmouth, waiting for the winds to move to the East which they will do tomorrow, Monday. So we will depart for our final push up the Bay which we plan in 2 long 75 mile days or 3 50 mile days. Either way, we will be back “HOME” in Rock Hall, MD by mid week. The journey’s end is in sight…..and what a truly wonderful trip it has been…. Check out the scale of this photo…then look at next picture close up! I wonder how long it takes to off load a barge of gravel one scoop at a time?! Patrica on Cutter Loose prepared a beautiful french toast breakfast. Thank you Patricia and Eric, you guys are the fleet’s best chefs! Thank you Portsmouth VA for your wonderful hospitality and great Olde Town historic section. We sincerely appreciate this city…. Traveling north from Beaufort NC and up to Oriental, NC then on through the Pungo River Canal and into the Albemarle Sound was another very interesting and winding section of the waterway. Cypress swamps of the Pungo River Canal and open water sailing on, the Neuse River and Albemarle Sound make this one of the most enjoyable sections. We ran 65 miles from Alligator River to Great Bridge Lock, on the Virginia Cut side. We usually run up to Elizabeth City and the Dismal Swamp, but the draw of the wonderful Mexican restaurant, El TORO LOCO, at Great Bridge was too much to pass up so we came north on the Virginia Cut. Carey, on SP CATSPAW, our team leader led us to the FREE dock just north of the Great Bridge lift bridge. We were docked just after the 1700 bridge opening and off to the Mexican restaurant by 1800 hrs! We will press on a short day today, making Portsmouth and hopefully the High Street Ferry Basin as we need to wait out the 15-20 knots of NE winds that will have the Chesapeake Bay kicked up with 3-4 foot waves! Looks like it will be a few days in Portsmouth and Norfolk, VA….not a bad place to wait out some weather! Salt Spray on Neuse River after washing and hand drying the boat! Tugboat named ANGER MANAGEMENT pushing a crane to Norfolk at 4 knots. Pushing at only 4 knots? I, too, would need Anger Management! NOTE: Mosey, the yacht that passed us is here also….she is hand built! OK….time to relax after long days and enjoy Portsmouth, VA! The weather was perfect for making a side trip 12 miles southeast to Cape Lookout where we anchored out with buddy boat IP460 Cutter Loose. We enjoyed exploring the lighthouse keeper’s home, the ocean beaches and the beautiful Cape Lookout Bight. It was beautiful and surprisingly un-crowded for a lovely Saturday. After one day at Cape Lookout, which was not enough, we pressed on north to arrive at River Dunes, a most beautiful resort marina. Here we re-connected with our Team Leader, Carey on SP Cruiser Catspaw. It was great to get back together again as we have shared New England to Abacos together and now we will run to the Chesapeake. The interesting aspect to running the ICW is the fact that you keep running into people you have met along the way. You get ahead of someone and then take a few days off, then they pass you and you meet up again in another harbor. It is that way with the 40′ Beneteau GOOSE BUMPS, with Mike and Barb from Stuart FL. We first met them in Man-O-War Abacos, then on a cocktail dinghy drift in Marsh Harbor and here they are in River Dunes, running for the Chesapeake, too. The paintings are called the DAY MARK to identify each lighthouse during the day from sea! It is a small world out here, with everyone looking out for each other, so helpful and friendly. Cruising is a wonderful life…. This is our third trip through the Waccamaw River, and as many cruisers before have said, this is the most beautiful section of the Intracoastal Waterway. This section is just south of Myrtle Beach, SC and north of Georgetown, SC. Bookended by steel mills and paper pulp factories of Georgetown to the south and high rise condos, shopping outlets and golf course of Myrtle Beach to the north, the Waccamaw River stands pristine in between these two contrasts. Maybe it is the fact that you leave such harsh environments and then are transported into the beauty of the wild and that is why it seems so beautiful. There are not many places like this left on the waterway; most of the land from Norfolk VA to Key West FL has been built up and is no longer in a natural state like the Waccamaw River. I always take hundreds of photos in this section, and it is difficult to select a few of the best, but here they are. My photo essay of the Waccamaw River on the ICW 2012…. To the north you exit Waccamaw River at Socastee Swing Bridge. One of the few bridges placed onto the National Historic Register for protection! Great Dune Bridge at Myrtle Beach reminds you that you are no longer in the Waccamaw River! Fifty miles on the ICW north of Beaufort towards Charleston took 2 short days of traveling but required 2 long days of concentration on the winding rivers and landcuts, watching for shallow water. We anchored off the City Marina for one night, went ashore for a long walk, and then moved to the Charleston Maritime Center at slack tide at noon on Thursday, May 3. New friends, Jim and Carol on IP-370 A Summer’s Day, joined us for lasagna with Cutter Loose and Catspaw and our long-time friend, Janet Charbonneau. Seating nine for dinner on a boat is a challenge and the solution was the guys in the cockpit and the gals in the salon. Friday we washed the many layers of salt off the boat, strolled King Street’s lovely retail shops and the Straw Market and then went out to dinner at Blossoms for incredible seafood and great company. The lure of Charleston is so strong, we decided to wait for the mid-day slack tide instead of the early morning tide to depart on Saturday. We made good use of the additional time – we went to Caviar and Bananas for breakfast with Team Cutter Loose and thoroughly enjoyed a horse drawn carriage ride through the neighborhood around the Old Jail House with Team Catspaw. We learned so much from our driver, Janice, who expertly drove Ralph through the narrow streets. There are five different carriage companies, providing five randomly assigned tours. The horses may only work five hours a day, 6 days a week and are given 3 months out to pasture each year. There is a citywide program for cleaning up “radiator leaks” if a horse’s diaper fails. Charleston is called “The Holy City” because it has 182 churches, including the first Unitarian Church in the nation. Even though it was Benjamin Franklin’s idea, Charleston was the first city to implement fire insurance companies. The city’s many fires were exacerbated by using black cypress, a wood that retains its oily and flammable properties long after construction. Eventually, this wood was outlawed completely. Charleston’s famous privacy porches were built facing the prevailing south and westerly breezes. If the street door to the porch was open, visitors were welcome to come onto the porch and knock on the center front door. However, if the street door was closed, it was expected that passers-by would not even look at the people on their porches because they might be sitting in their underwear! Charleston, SC…an ICW town that is very inviting and very beautiful and very fun to visit…. Like our passage south, we decided to skip the Georgia ICW, because in that state you go 2 miles east and west for every mile north. We had a great weather window, as usual in late April and early May, so we planned an overnight run of 120 nautical miles from Fernandina Beach, FL, to Beaufort, SC. Carey and Bobbi are the couple whose lead we have followed for this entire one year trip. We count them partially responsible for us retiring and jumping into this dream life of cruising. So it was a a great night to be back together. From Beaufort we ran towards Charleston, SC, where we anchored 17 miles short of the city for a peaceful night on anchor in Church Creek. Tomorrow we will make Charleston, SC, a town we really enjoy…..
Next stop will be Charleston, SC, where we will dock for a few days to clean up these salty boats and enjoy the city.